I first was drawn to these beautiful flowers at my local co-op. They had a simple, effortless elegance about them. Bright and full of texture, using flowers that I have never seen before that felt whimsical and from a beautiful wild field. I romanticized this incredible place and what it would be like, then I quickly noticed they were grown here in Minnesota, near Minneapolis! I became overwhelmed with the feeling of connection, I felt like through these flowers I was connecting to someone out there.. not knowing I would get up the courage to ask Jennifer if she would like to meet about a year later. When I visited Humble Pie Farm I was delighted to find that my floral fields from my dreams were incredibly real. Jennifer was as soft and good-natured as I imagined too. She spoke with such grace and bliss, she was incredibly inspiring. She welcomed me with open arms and was so incredibly generous. Musing about farm life I am sure we all think, “oh what the life!” and yes in many ways it can be like that, but it can also be very stressful and a lot of hard work! 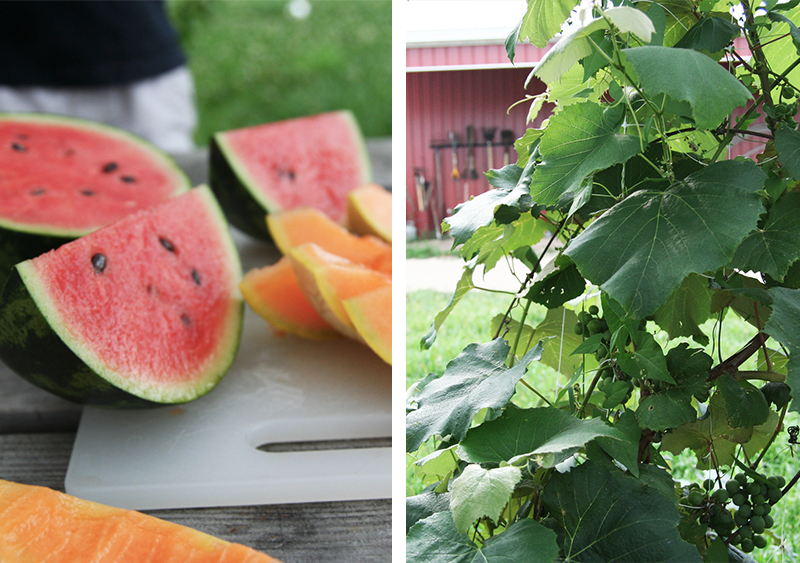 I am very thrilled to introduce you to my new friend, Jennifer Nelson with Humble Pie Farm! What is Humble Pie Farm? 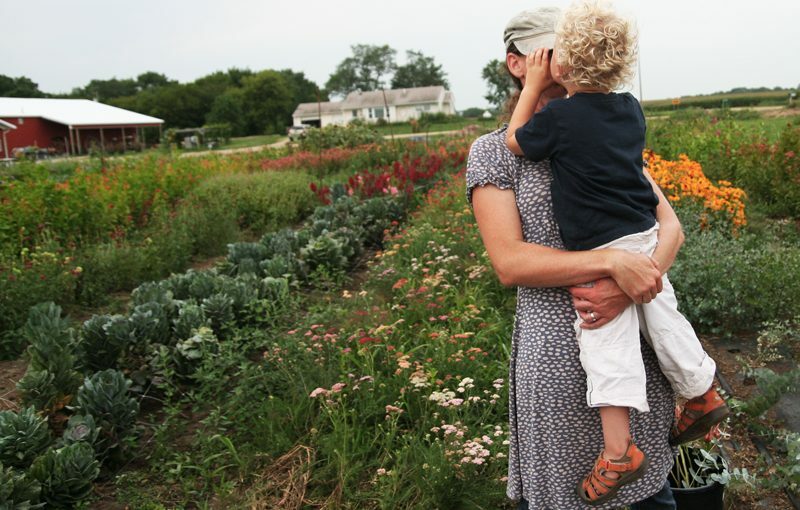 Humble Pie Farm is a small family flower farm. 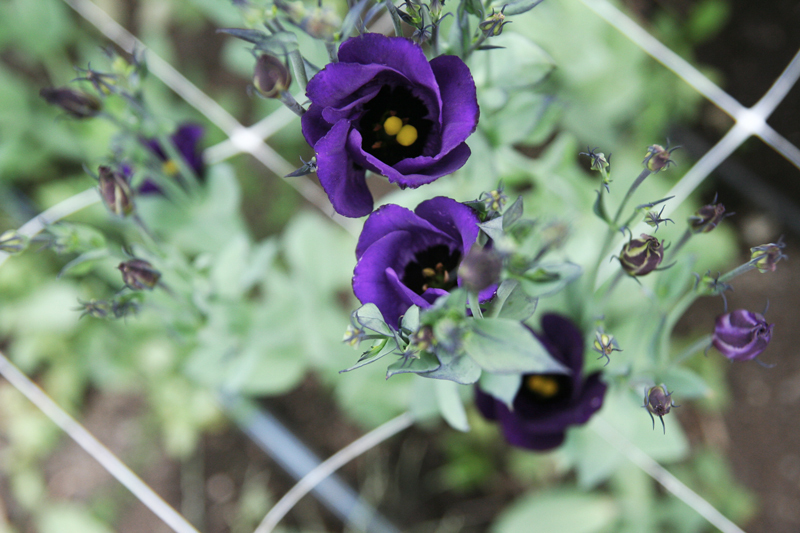 We grow beautiful, in season flowers using organic methods for our local Twin Cities region. We offer CSA share bouquets, event flowers and local co-op and Whole Foods retail mixed bouquets in a natural, bohemian design style that showcases the spectacular beauty of fresh, in season flowers. How did you get started creating your passions into a business? I’ve had a few lives, and jobs and a winding path has led me to flower farming. I really knew that I wanted to farm and live close to the earth in 2009 when I started working for an organic vegetable farm. I love being outside, and the satisfaction and tangibility of working in the dirt with the earth, its cycles and wisdom, was like no other I’d ever experienced. I love feeling tired and dirty at the end of the day, and being able to see what I have accomplished. I also love good real food, and the beauty of flowers and natural growing plants. Our Humble Pie Farm flower tagline is “nourish your spirit”. I feel there are lots of malnourished spirits in the world. Flowers bring joy and also often mark celebration and big event ritual. We love having a little part in that. Also, flowers create a wonderful pollinator habitat and diversity of landscape and soil health. What are some of the practices you stand for in farming? We use only organic methods, are working on our Organic Certification. We understand that we are participants in a big system. We provide food for beneficial insect and butterfly life, and start with healthy soil first. How do you spend your time; What other endeavors are you a part of? 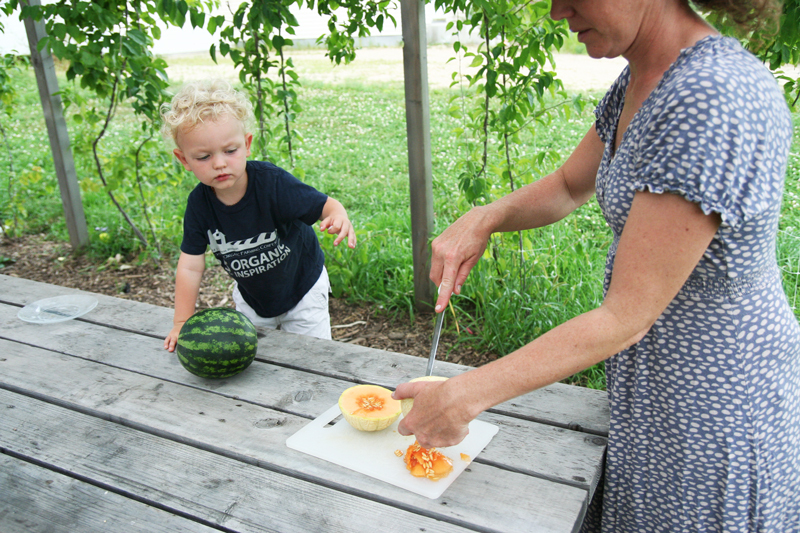 I’m a mama, a teacher and most recently an organic specialist working for the Midwest Organic and Sustainable Education Service in western Wisconsin. What are challenges you encounter by being a business owner and farmer? Balance of work and parenting is a continual challenge. And wanting to include my 2 and a half year old in the work is a challenge and a delight. 🙂 I love that he knows the names of birds, and considers them and insects, his friends. I love that he knows the names of flowers and fruits and vegetables. He and my husband go for farm tours around the vegetable fields, and that is their special time. He loves to munch on heads of broccoli, and kale leaves, and watermelon of course. My joke is that he eats his vegetables in the field with a side of dirt. That delights me to no end! I love that my child is healthy and prefers being outside and doesn’t mind getting wet or sweaty or dirty. I grew up disconnected from the earth, and in my winding path back to connection, have become healthier and happier and more grateful. I’m so grateful that I get to raise my son close to the earth. How do you find inspiration? For the planting season and floral design? I have a strong faith, and that is my foundation. I like to be quiet and meditate, and walk in nature, That gives me the most energy. I also love to be with my family outside. I’m inspired by honest, hard-working people in the struggle. Life is beautiful and grand, and difficult and mundane, and those focused on the positive and doing what we can, each day, inspire me. I also recognize that we are very, very fortunate in the big scope of things, and try not to forget that and get stuck in the everyday challenges. As for flowers and design, I love seed catalogs, and Instagram, and we are members of the ASCFG which is very helpful. The local flower movement is really catching on, and there’s a wonderful national community around it. I love to see what others are doing. I also get so much inspiration from nature. Flowers are most beautiful in the field, and I try to emulate that. Why is it important that flower farms are in our local communities? How do they impact our life, food and surroundings? Flowers bring an abundance of beneficial insects and birds and diversity of soil food to our thriving land. 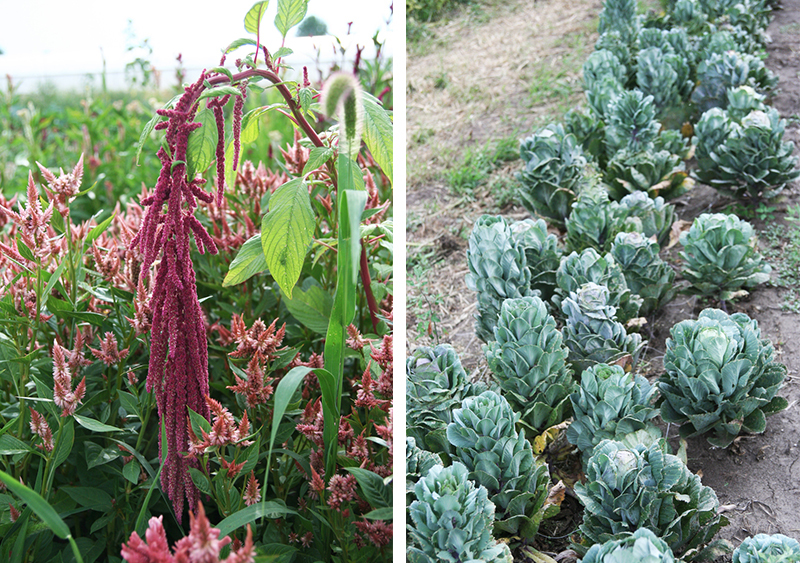 Veggies are better pollinated and sweeter because of flowers. We spend most of our small family farm income locally, so as you invest in us, we invest in our community. And the natural beauty of our flowers nourish the spirit of our community. Still, about 80% of flowers in the U.S. are imported. They are often sprayed with unhealthy chemicals. The people that have grown them and worked with them are often not paid well, and their health suffers from working with unhealthy chemicals. Not to mention the carbon footprint that is so much smaller when you buy local flowers. Healthy, organic flower farms make for healthier land and inhabitants, local economy, and beauty and diversity of landscape. Creating positive and healthy eating habits and relationships with food and our goods is a large part of what inspires us, how do you help connect people to the earth? We love to have visitors to our farm. A part or our Humble Pie mission is to provide an opportunity to reconnect people with the earth for which we have a deep yearning. The result of that connection are healthier relationships with food, and ultimately, each other. When I started buying your flowers at my local Co-Op I felt a sense of connection, love and warmth without even having met you yet… How do you describe how buying local flowers can make people feel? I love that! That’s what we want! There is a certain energy from something that has been grown and created with love. I think that’s palpable. What is your favorite flower right now and why? We grow annual flowers from seeds, bulbs and a few perennials. We’ve been renting land for our three years of existence so we’ve grown everything as an annual. We just! closed on our own farm in Plum City, Wisconsin, so next year we’ll begin to fulfill my vast perennial dreams! 🙂 As we get to know our new soil, we’ll know better what it wants to grow, or not. I fall in love with a new flower each week. This week I’m in love with zinnias. They just keep coming, and a big, beautiful healthy zinnia is breathtaking. 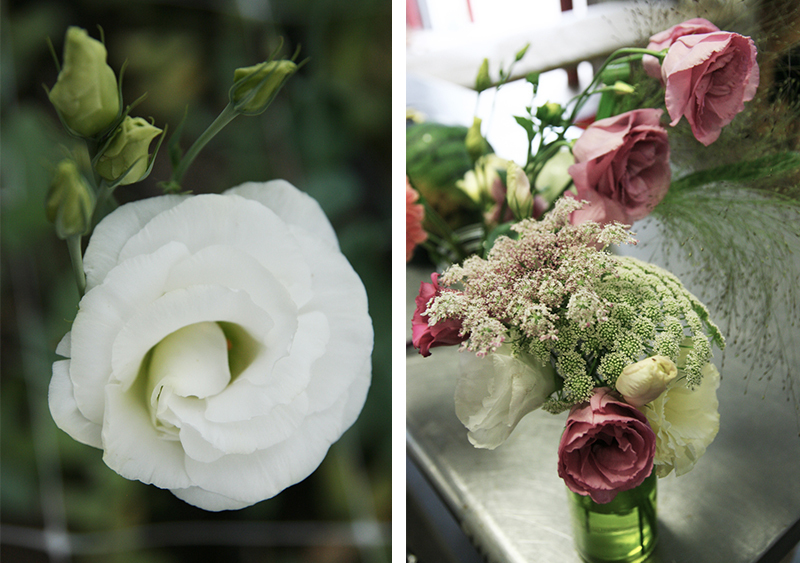 I also love lisianthus, and dahlias, and and…I love them all. Zinnias, sunflowers, marigolds, calendula, dianthus. I recommend buying healthy organic flower starter plants instead of starting flowers from seed, until you get used to growing something. What are some mindful practices that I can adopt for my own yard that could help the growth of my flowers while also allowing me to be kinder to my environment and community? Use your hands! Don’t spray and embrace dandelions! 🙂 Flowers like fish emulsion, or another organic fertilizer, an always, always, everything starts with soil health. What is your family like? How do they help to support you and your passions? I have a wonderful husband who is a papa, organic farmer and peace-maker. He is also my business partner. He supports everything I do. We have problem-solving opportunities like any good life and business partner relationship, but we are a great team. I can’t describe with words how thankful I am for his presence and influence in my life. I adore him. We have an almost three-year-old son. He’s a lover of small and large machinery, vegetables eaten in the field with a side of dirt, cooking, playing, reading books, and really anything fun. He has a wonderful enthusiasm for life and teaches me everyday. I’m always reading any number of things, often not finishing them, especially now. One-Straw Revolutionary: The Philosophy and Work of Masanobu Fukuoka is on my desk right now. What is your favorite quote or mantra that you live by right now? Be still. Our life is crazy as transition to move and I become a working off-farm mama and I constantly have to remind myself to slow down. It’ll all be fine. Where do you see Humble Pie Farms in the next 2-3 years? Any big plans you want to share? Transitioning and learning how to farm our own land in western Wisconsin! We have a big learning curve with different soil, and climate, putting up a greenhouse, etc. 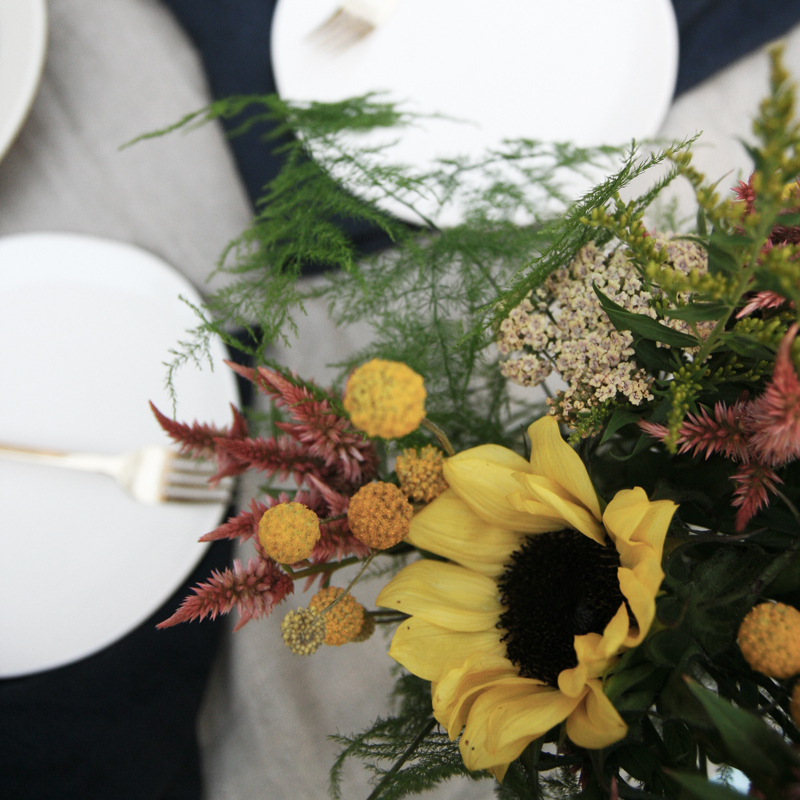 Next year, we’ll continue to make mixed flower bouquets, grow some veggies too, and in the future we’d love to grow Certified Organic flower transplants for flower farmers, and eventually be an event space for weddings! Lastly, how can I support you? Where can I buy your flowers? What is the CSA Flower Share? The CSA share is a weekly bouquet for 14 or 7 weeks that you pick up at the farm or the Birchwood Café. You can purchase on our website with PayPal, or send us a check. 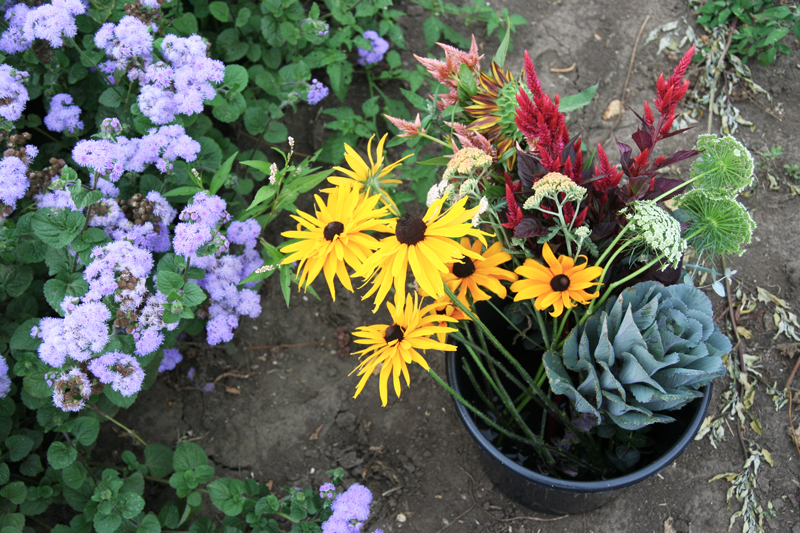 You can also buy our bouquets weekly at the Seward, Wedge and Lakewinds Co-ops, and five metro area Whole Foods. We love to do wedding flowers as well, and we can talk more about that if you contact me at Jennifer@humblepiefarm.com. Visit our website here. I love this article, thank you for sharing. My flower growing days are waning,but I love flowers and will look for her flowers!